Here at Almond Vocational Link, we love hearing back from our partners and students after each completed project, feedback is incredibly important to us. 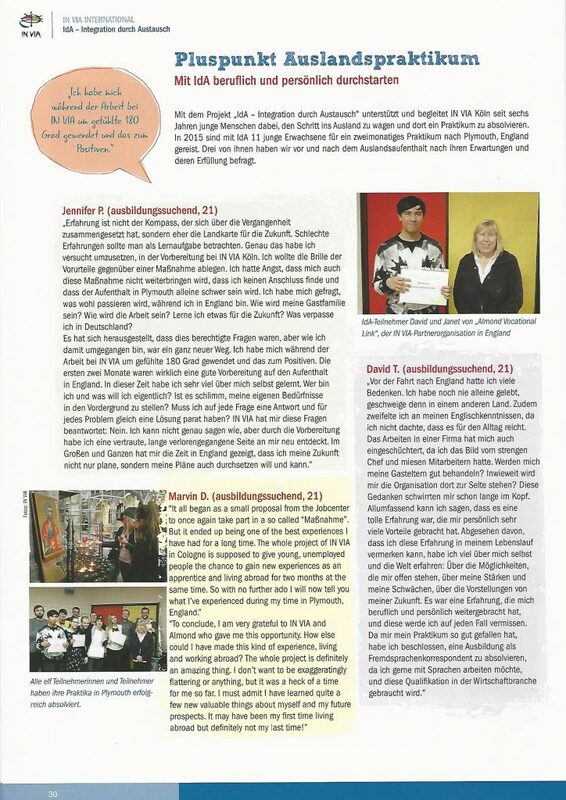 We were delighted to have recently received a copy of a magazine from our German partners, in which we found a lovely article about their group. In October 2015 we had a pleasure of hosting 11 young unemployed for 2 weeks of language training followed by 6 weeks of work experience as part of ESF project organised by IN VIA – job centres in Cologne, Bonn, Rhein-Erft, Rhein-Sieg and Euskirchen. You can read more about this project here: Perspective Europe Returning to Employment We look forward to working together on their future projects. Become a Host Family for our Teachers and Students coming from abroad. Airborne from JMA on Vimeo.